DOUGLAS COUNTY – Schools, clubs, teachers, nonprofit groups, youth clubs and others involved in education are invited to join the Umpqua Valley STEAM Hub in marking STEAM Weeks, taking place from May 2-16 2015. The local dates have been extended from the statewide observance to allow participation over two weeks. STEAM Week is set aside to highlight activities in the fields of science, technology, engineering and math, all linked by artistic innovation (the “A” in STEAM). 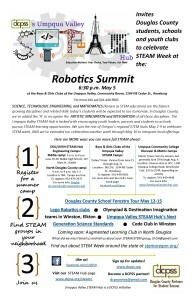 Community groups and families are encouraged to join activities scheduled in Douglas County, including looking into and registering for local STEAM summer camps or joining STEAM-related clubs in their neighborhood. Organizations with their own STEAM Week projects and gatherings are invited to share information about those events on our website events calendar, as well as any ongoing activities throughout the year. Submissions to the calendar can be made HERE. The STEAM Hub is an initiative of Douglas County Partners for Student Success. DCPSS is a group of community leaders invested in developing successful connections for all kids from cradle to career among parents, educators and students. For more information about the Umpqua Valley STEAM Hub, contact Project Manager Lisa A. Lanza at 541-440-7848 or Lisa.Lanza@umpqua.edu. To find out more about statewide STEM Week (May 2-9) efforts, visit www.stemoregon.org.